You probably won't be surprised to hear that NYC Schools Chancellor Carmen Fariña loves her some colocated schools. She seems to think that colocated schools are better than small schools. The only really issue with that line of thinking, of course, is that colocated schools are small schools. They're a remnant from the Bloomberg era of shutting down comprehensive high schools and placing little boutique schools in their place. They started out great, since they got to hand pick students. It turns out when you take whatever students you wish, ignore ELLs, students with special needs, students who are homeless, and students who inconveniently get low test scores, you have fewer low test scores and therefore get higher test scores. That's pretty much how Carmen Fariña built her reputation. What keen insight. That works, of course, and many charter schools have replicated this model, thus drawing the praise of various NYC editorial boards. But the small schools, alas, were told to start taking representative samples of NYC kids, and who would've thunk it, started to perform just as other schools. Like most educational miracles, this too was predicated on fraud. No fraud, no success, and thus Bill Gates got off of the small school train he himself had started. But Bloomberg plodded on. The small schools were fantastic. They contained a whole lot of newbie teachers who didn't cause trouble. Many of them don't have to worry about union interference. Sometimes when I go to grieve class sizes I meet reps from small schools who the principal has sent. They aren't chapter leaders because they haven't got chapter leaders. I'm sure they aren't all like that, but it was certainly convenient for Mayor Mike to take a school with one chapter leader, break it into five schools, and send that nasty old chapter leader into ATR World. The thing now is that Fariña wants cooperation. It turns out that, if you have five small schools and let them share facilities and classes, the students get more choices. Eureka! The only thing missing from that thought process is the notion of reversing the split. For example, in a big school like mine, kids have as many or more choices as the kids in colocated schools. We don't have five principals. So my question is, why has that not occurred to Carmen Fariña? 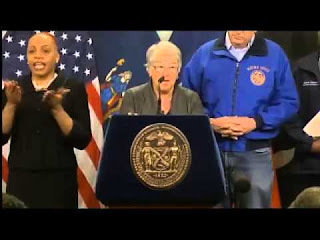 Alas, Fariña, like a whole lot of people in the DOE, is a remnant of the Bloomberg administration. It's time for de Blasio to clean out Tweed and bring in new people. It's time for him to place his own stamp on education. It's no small coincidence that it's also time for him to run for re-election. I think his chances are much improved, given the insanity that was the Presidential election. A UFT endorsement would help. Let's hope that our leadership wakes up and tells him they want a new broom at Tweed. It would be nice if we actually accomplished something worthwhile before "Right to Work" becomes enshrined in national law and we move back to the nineteenth century.